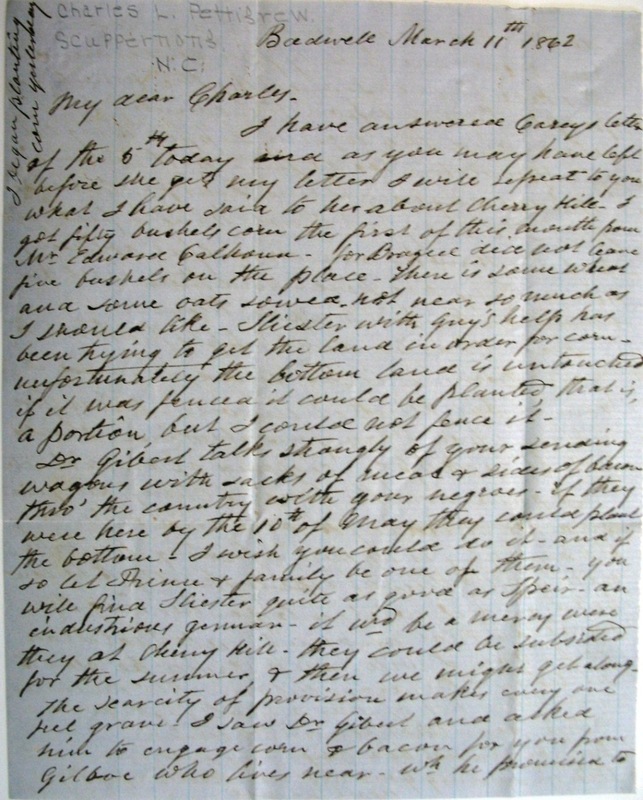 Item description: Letter, 11 March 1862, believed to be from John Gough North, Badwell Plantation (S.C.) to his son-in-law Charles L. Pettigrew of Scuppernong, N.C. North writes of the scarcity of provisions, the movement of slaves, and cautions Charles against destroying his barns (possibly as a drastic measure to keep the barns out of the hands of the enemy). Item citation: From folder 252 of the Pettigrew Family Papers, #592, Southern Historical Collection, Wilson Library, University of North Carolina at Chapel Hill. 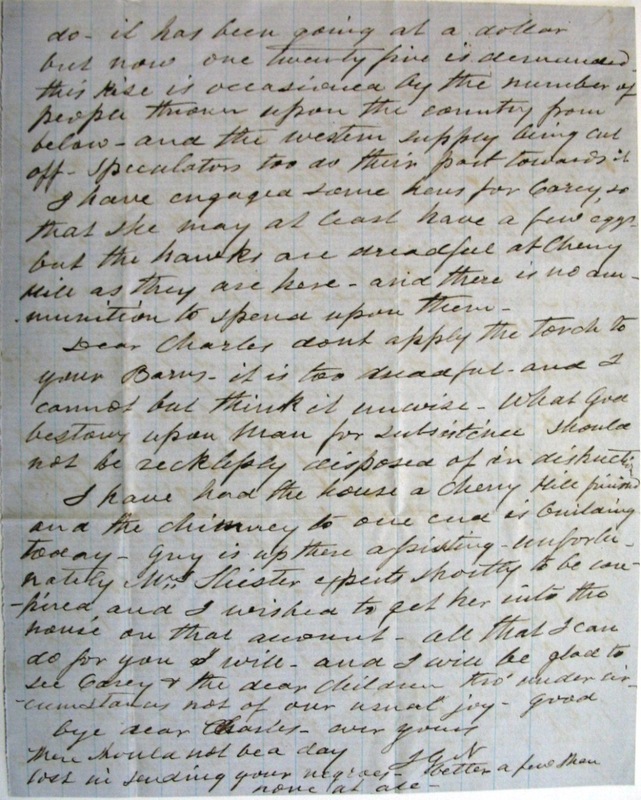 I have answered Carey’s letter of the 6th today and as you may have left before she gets my letter I will repeat to you what I have said to her about Cherry Hill. I got fifty bushels corn the first of this month from Mr. Edward Calhoun – for Badwell[?] did not have five bushels on the place. There is some wheat and some oats sowed, not near so much as I should like. Shister[?] with Guy’s help has been trying to get the land in order for corn – unfortunately the bottom land is untouched. if it was fenced it could be planted, that is, a portion but I could not fence it. Dr. Gibert talks strongly of your sending wagons with sacks of meal & sides of bacon[?] thro’ the country with your negroes. If they were here by the 10th of May they could plant the bottom. I wish you could do it – and if so let Prince & family be once of them. You will find Shister[?] quite as good as [?] an industrious german[?] – it wd. be a mercy were they at Cherry Hill. They could be subsidied for the summer, & then we might get along. The scarcity of provision makes every one feel grave. I saw Dr. Gibert and asked him to engage[?] corn & bacon for you from Gilboe[?] who lives near. – wh. he promised to do. it has been going at a dollar but now one twenty five is demanded. this rise is occasioned by the number of people thrown upon the country from below, and the western supply being cut off. speculators too do their part towards it. I have engaged[?] some hens for Carey so that she may at least have a few eggs, but the hawks are dreadful at Cherry Hill as they are here – and there is no ammunition to spend upon them. Dear Charles don’t apply the torch to your barns. it is too dreadful and I cannot but think it unwise. What God bestows upon man for subsistence should not be recklessly disposed of in destruction. I have had the house a Cherry Hill finished[?] and the chimney to one … is building today. Guy is up there assisting – unfortunately Mrs. Shister[?] expects shortly to be [?] and I wish to get her into the house on that account. all that I can do for you I will. and I will be glad to see Carey & the dear children, tho’ under circumstances not of our usual joy. good bye dear Charles. there should not be a day loss in sending your negroes. better a few than none at all. This entry was posted in Southern Historical Collection and tagged Badwell Plantation, Charles Pettigrew, Pettigrew family, Scuppernong, South Carolina. Bookmark the permalink.